Received wisdom suggests that the majority of exporters in a country sell most of their output domestically. This column presents recent research that casts doubt on this assumption. The distribution of export intensity varies substantially and in most countries there are ‘twin peaks’, with some firms exporting a lot of their output, and others a little. This would be consistent with a standard model of international trade if the model were adjusted to recognise that firms differ in the demand they face in each market. The first two stylised facts have been verified in many countries, but the third is based on studies that use firm-level data from only Colombia (Brooks 2006), France (Arkolakis 2010, Eaton et al. 2011) and the US (Bernard et al. 2003). In recent research we show that this stylised fact does not accurately characterise export intensity – the share of a firm’s total revenues accounted for by exports, conditional on exporting – within countries around the world (Defever and Riaño 2017b). Using harmonised firm-level data for 72 countries drawn from the World Bank Enterprise Surveys (WBES) between 2002 and 2016, we are able to show that the distribution of export intensity varies substantially. 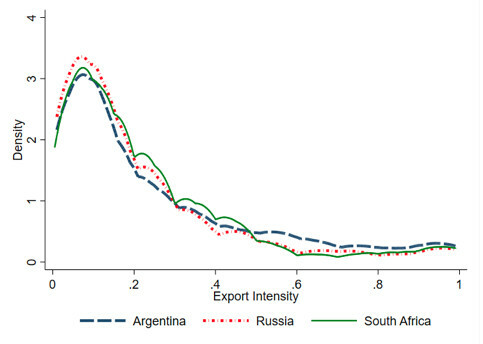 In Figure 1, Argentina, Russia and South Africa (Panel A) exhibit the same pattern as was identified in previous studies. In this case, firms with export intensity below 0.2 constitute more than half of exporters, while firms with an export intensity above 0.8 account for less than 10% of exporters. 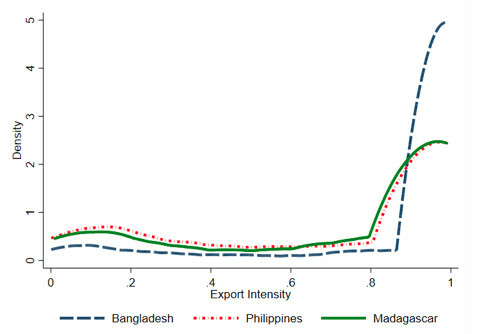 In Bangladesh, Madagascar and the Philippines (Panel B), it's the opposite – the average share of exporters with intensity below 0.2 and above 0.8 are respectively 11% and 75%. 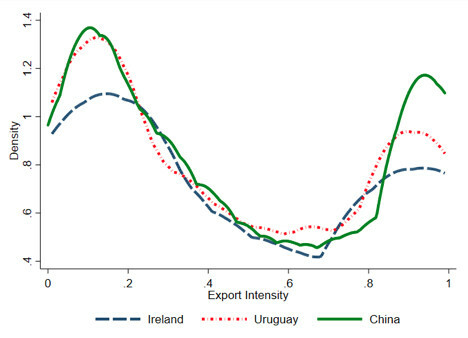 And then Ireland, Uruguay and Chile (Panel C) display ‘twin peaks’ – a bimodal distribution in which the mass is concentrated close to both extremes. the twin peaks are typical of two-thirds of the countries in our sample, for which a statistical test shows the distribution of export intensity is bimodal. Why are the twin peaks important? In our paper we show that the existence of twin peaks affects the response to globalisation. As trade costs fall, our model predicts exporters dramatically increase their export intensity. This widens the gap between globally-engaged firms and those that are domestically oriented – a response that might have broader implications for inclusive growth, an issue raised by the OECD (2017). 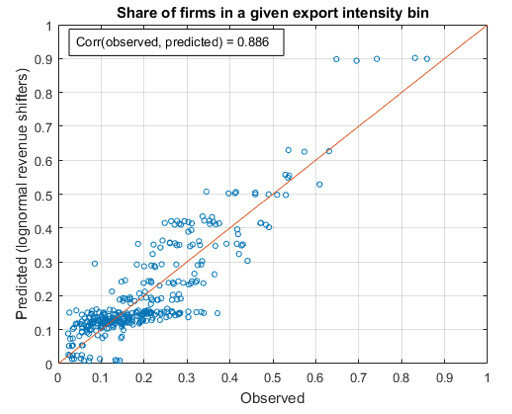 Characterising accurately the distribution of export intensity in an undistorted economy is key if we want to infer the magnitude of distortions that affect firms' access to foreign markets, following the approach pioneered by Hsieh and Klenow (2009). This strategy has been used to assess the contribution of trade policy and technology when explaining changes in trade openness (Alessandria and Avila 2017), to quantify the effect of preferential access to foreign exchange (Brooks and Wang 2016), and to evaluate the welfare cost of incentives subject to export performance requirements (Defever and Riaño 2017a). Kohn et al. (2017) and Alfaro et al. (2017) have shown that differences in firms’ export intensity shape the response of aggregate exports, as well as firm productivity and R&D investment to large exchange rate depreciations. Can we explain the twin peaks? The workhorse models of international trade in which firms differ only in their productivity, such as Melitz (2003), do not predict the wide range of patterns presented in Figure 1. In a two-country model with CES preferences, all exporters sell the same share of their revenues abroad. When there are more than two countries, more productive firms have a higher export intensity than less productive ones because they serve more destinations. But if the model is to be consistent with the well-established fact that a small number of large firms coexist with a large number of small firms (Axtell 2001), it cannot generate right-skewed or bimodal export intensity distributions. Under these circumstances, we are able to show that the distribution of export intensity would be bimodal, with modes near 0 and 1. The ‘height’ of each mode is determined by a country’s size. Thus, in countries that are relatively large compared to their trade partners, most exporters will sell the majority of output domestically. In relatively small countries, high-intensity exporters are prevalent. Intermediate countries have twin peaks. Figure 2 shows that when we estimate the structural parameters of the model, the data fit extremely well. So, conditional on firm-destination-specific factors exhibiting sufficiently high dispersion, differences in relative market size explain most of the observed variation in the distribution of export intensity across the world. Do other explanations fit the data? We carry out a thorough robustness analysis of our main result that lent strong support to this mechanism. To ensure that our results are not a figment generated by the WBES data, we asked some researchers to calculate the distribution of export intensity using nationally representative firm-level surveys for a subsample of countries in our data. We find that the WBES data provided an accurate picture of the distribution of export intensity. In almost all the countries we examine, we observe a higher share of exporters in the extremes of the distribution in the national surveys than in the WBES. So, if anything, it seems that we might be underestimating the prevalence of twin peaks. We explore the possibility that the bimodality of the export intensity distribution is the result of a composition effect – this would occur if most exporters were low-intensity ones, but some types of firm were particularly inclined to export. We find that the dispersion of firm-destination-specific revenue-shifters is still high enough to create twin peaks when we exclude multinational affiliates, firms engaged in processing activities, and even firms that exported all their output. About half of the countries in our data provide incentives conditioned on firms’ export intensity, particularly in special economic zones and duty-drawback regimes. The use of incentives subject to export share requirements (ESR) might distort a country's export intensity distribution, because some firms would chose a higher export intensity in response (Defever and Riaño 2017a). Excluding countries that rely on these incentives did not alter our conclusions. Although our data consist mostly of developing countries, there is a bimodal export intensity distribution for both OECD and non-OECD countries. Bimodality is not driven by the sectoral composition of exports in a country. The distribution of export intensity is bimodal even in broadly defined industries. The bottom line is that, regardless of how you slice it the data, the distribution of export intensity appears to be bimodal. Alessandria, G and O Avila (2017), “Trade Integration in Colombia: A Dynamic General Equilibrium Study with New Exporter Dynamics”, University of Rochester. Alfaro, L, A Cuñat, H Fadinger, and Y Liu (2017), “The Real Exchange Rate, Innovation and Productivity Growth: A Cross-country Firm-level Analysis”, University of Mannheim. Arkolakis, C (2010), “Market Penetration Costs and the New Consumers Margin in International Trade”, Journal of Political Economy 118: 1151-1199. Axtell, R L (2001), “Zipf Distribution of U.S. Firm Sizes”, Science 293: 1818-1820. Bernard, A B, J Eaton, J B Jensen, and S Kortum (2003), “Plants and Productivity in International Trade”, American Economic Review 93: 1268-1290. Bernard, A B, J B Jensen, S J Redding, and P K Schott (2007), “Firms in International Trade,” Journal of Economic Perspectives 21: 105-130. Brooks, E (2006), “Why don’t firms export more? Product quality and Colombian plants”, Journal of Development Economics 80: 160-178. Brooks, W and J Wang (2016), “The Aggregate Effects of Firm-Level Trade Distortions”, University of Notre Dame. Defever, F, and A Riaño (2017a), “Subsidies with export share requirements in China”, Journal of Development Economics 126: 33-51. Defever, F, and A Riaño (2017b), “Twin Peaks”, CEP Discussion Paper No 1505. Eaton, J, S Kortum, and F Kramarz (2011), “An Anatomy of International Trade: Evidence from French Firms”, Econometrica 79: 1453-1498. Hsieh, C-T and P J Klenow (2009), “Misallocation and Manufacturing TFP in China and India”, Quarterly Journal of Economics 124: 1403-1448. Kohn, D, F Leibovici, and M Szkup (2017), “Financial Frictions and Export Dynamics in Large Devaluations”, Federal Reserve Bank of St Louis. Melitz, M J (2003), “The Impact of Trade on Intra-Industry Reallocations and Aggregate Productivity”, Econometrica 71: 1695-1725. Melitz, M J and S J Redding (2014), “Heterogeneous Firms and Trade”, in Handbook of International Economics, ed. by K Rogoff, E Helpman and G Gopinath, Elsevier, vol. 4: 1-54. OECD (2017), Bridging the Gap: Inclusive Growth 2017 Update Report. This result obtains when the firm-destination-specific differences in sales are distributed lognormal, gamma of Fréchet – three of the most frequently distributions used in the literature to model firm heterogeneity.